Photo courtesy of the Magic Castle and Academy of Magical Arts website. Every morning, Long Beach resident Joe Furlow wakes up and heads to Long Beach’s Wardlow and Pacific station to hop on the Metro. His commute may appear astonishingly average to the casual onlooker: sitting on one of the train’s seats, glancing at his emails and responding on a digital device. Every morning, once downtown, he heads outside like any other commuter and switches trains. At the intended stop, he exits and walks a few blocks to his destination. His office looms above Hollywood traffic on a hill, requiring a steep walk up. And every morning, Furlow climbs that incline and enters the hallowed halls of his workplace, which also happens to be a historical icon: the Magic Castle. Joe Furlow on the job. Photo by Keeley Smith. It takes Furlow about one hour and five minutes to reach the magical property, which has hosted the likes of thousands of magic aficionados—celebrity and non-celebrity fans alike. Current academy membership boasts the likes of Steve Valentine and Chip Chalmers, Nicholas Cage, Hugh Hefner, Drew Barrymore, Jimmy Kimmel, Zoe Saldana, Sarah Silverman and more. Since the castle’s opening in 1963, Cary Grant, Tony Curtis and more mingled in the glamorous meeting spot and center for magic. The interior entryway of the Magic Castle. The bookshelf features a hidden doorway. Photo by Keeley Smith. 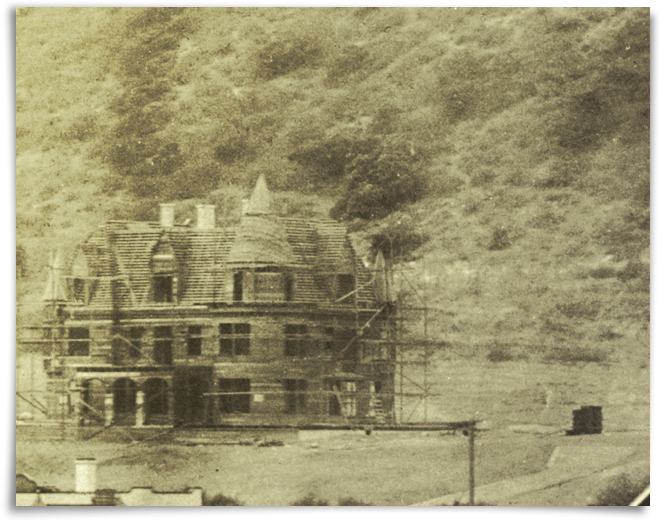 The mansion, built in the early 1900s, has been home to a variety of business enterprises, but none for so long as magic, as envisioned by the Magic Castle’s founders, Milt Larson and Bill Larson, Jr., who came from a family of magicians and worked in the entertainment business themselves. In fact, Milt was a writer for NBC’s Truth or Consequences, and worked in an office overlooking the mansion before they decided to nab the property. 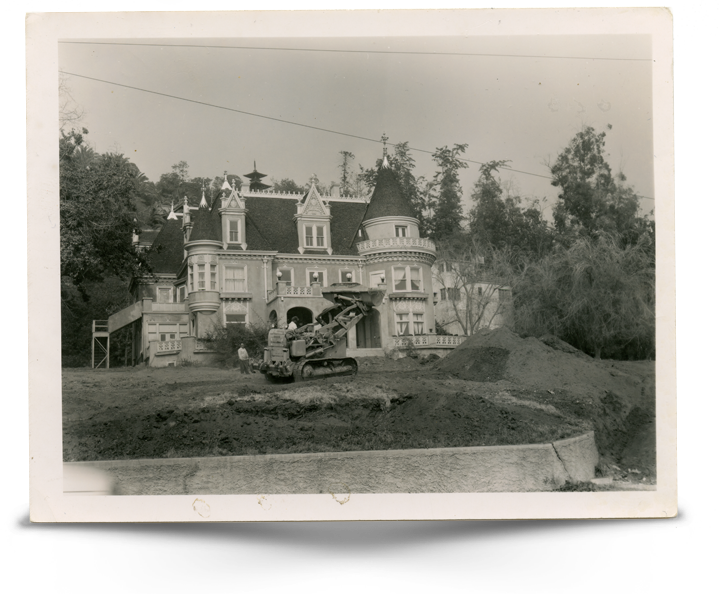 Construction of the Victorian mansion that became the Magic Castle. Photo courtesy of the Magic Castle website. Magicians who have shown off their magic within the walls of the quirky Victorian mansion include such contemporaries as David Blaine and Seigfried and Roy, as well as historically significant members like Doug Henning, Harry Blackstone, Sr. and Jr., Channing Pollock and Dai Vernon. The former house is situated much like a maze, with dark rooms highlighting antique images of Hollywood and the faces of famous magicians and Hollywood royalty. The grounds have long attracted the entertainment world’s elite, perhaps now more than ever. During the tenure of former Board President Neil Patrick Harris, attendance and revenues soared, something Furlow attributes to better food, management and a resurgence in magic. “Something about magic has changed,” said Furlow. According to Furlow, when he first began working for the Magic Castle, revenues totaled around $8.7 million, with $5.1 million in food purchases. By the close of FY 2015, in contrast, revenues totaled around $15.5 million and food and beverage sales soared to the $10 million range. After focusing on improving magic and offering more of it in the 18 showrooms within the castle’s grounds, attendance has skyrocketed to an average of 600 plus per weekend—”basically our max,” said Furlow. Where the magic happens: The castle’s largest showroom. Remaining photos by Keeley Smith. The membership of the Academy of Magical Arts, the entity Furlow technically manages, is composed of about half “associate” members and half “magician” members. Associate members have the opportunity to take magic classes from magicians and eventually become magicians, according to Furlow. Patrick Harris was in fact a magician member, said Furlow, as evidenced by his practicing of magic on How I Met Your Mother and as the host of numerous awards shows. Furlow said his proximity to high quality magicians has only made him appreciate the impact the shows have on those around them. Furlow said more than 5,000 members of the Castle are issuing more guest passes than ever before, a sure sign of pride in the business and magic. The Houdini Room: A more intimate space for dining and up-close magic. The room is designed in honor of Harry Houdini, inspired by a story of him communicating after death. Below, right: Painting of Harry Houdini in the Houdini room. For the uninitiated (or those who have yet to watch Judd Apatow’s Netflix series Love), only members can secure access to the Magic Castle, and a dress code is strictly enforced. When asked about the notorious dress code, which plays a pivotal role in Apatow’s show and prohibited the male lead from placing his suit jacket on his girlfriend’s shoulders in one of the episodes, Furlow laughs. “It’s not that dramatic—we support chivalry,” said Furlow. However, the enforcement, for the most part, is unapologetically strict. “If you dress classy, you act classy,” said Furlow. According to him, nobody gets by those rules, with the exception of Johnny Depp, who enters a private showroom without being seen in the common dining and gathering spaces. Otherwise, Magic Castle-goers are expected to maintain a sense of propriety, regardless of their celebrity, which has made for more than a few interesting situations. So Furlow walked over to the couple and began his talk. Shortly after the incident, Furlow meandered over to the floor manager. Other memorable moments included a request from Justin Bieber to use Furlow’s membership to gain access to the property. However, Beiber was not yet 21. One of the castle’s mid-sized showrooms. Both men regularly see the who’s who of Hollywood. Furlow recalled a night a few years ago, just a year or so into the job, when he grabbed a drink with Neil Patrick Harris and Casey Affleck and the band The Killers walked by. “It was around the time [Neil Patrick Harris] was filming Gone Girl with Ben Affleck,” said Furlow. He smiled at the memory and said such incidents were initially surreal, but are now something he considers as just another part of a pretty cool gig. Looking to the future, Furlow said he’s largely focused on expanding the business ventures of the Academy of Magical Arts, including classes for children, as well as creating more of a presence from the organization at magic conferences. He envisions the Magic Castle as being more than just an iconic performance venue—he sees it as a leading force for magic, worldwide. Academy of Magical Arts classroom. The Magic Castle and Academy of Magical Arts is located at 7001 Franklin Ave, Los Angeles, CA 90028.